RUSH: Folks, get mad at me if you want, but I’m just gonna tell you what’s happening at this gun rally in Tallahassee. There are now T-shirts, and there are signs. I’m gonna tell you this is becoming the Wellstone memorial on steroids. Do you know who they’ve dragged into this thing? The victims of the Pulse Nightclub shooting in Orlando. There are T-shirts with every slogan you have ever seen at a Democrat Party rally. I saw a student, is it a T-shirt on a sign? “Violence occurs greater in minority communities.” Oh, that was a student talking. “Violence disproportionately affects minority communities.” That was one of the students speaking at the rally. I’m telling you, folks, it’s undeniable and you can get mad at me all you want. Well, I know you aren’t gonna get mad at me. I’m gonna be misquoted, I’m gonna be mischaracterized and misrepresented, but I’m telling you, the Democrat Party has taken the thing over, if they’re not the people sponsoring it, in fact. And it’s the students here from the high school, how can they resist it? Their spirit, their heart here, it’s genuine. They’re the victims. They were shot at. But the vehicle and the opportunity to do this is being made possible by money coming from donors and contributors to the Democrat Party. You see anti-NRA signs, and you see, “Stop the guns, ban the guns.” Every slogan you can imagine. “Hope I don’t get shot today” is a sign that you see in the background here. “Hope I don’t get shot today.” The Democrats can’t resist it. The Wellstone memorial. They couldn’t resist it. I know many of you don’t even know what I’m talking about. It was 2002. So that’s 16 years ago, 15 and a half years ago. Paul Wellstone was a Senator in Minnesota, died in a plane crash. They had a rally, and it was before November. It was before the midterm elections in November. And the Democrats turned this thing into a full-fledged political rally, and it was a memorial. They had everything there but the casket. It was designed as almost funereal. And Wellstone had Republican friends in the Senate and colleagues, led by Trent Lott, and they showed up, and they were immediately booed out of the place. The Republican senators had to get up and leave. The crowd was shouting, “We don’t want you. You’re not wanted. Republicans, leave,” or some such thing. “You’ve got blood on your hands” or some such thing. 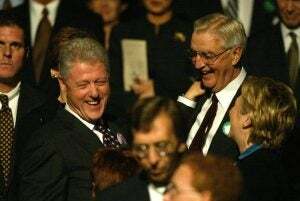 And Tom Harkin — you know what? Cookie, go back to the archives and grab some of the bites from the Wellstone memorial. I think it would be useful for those of you who don’t know what I’m talking about, to hear some of the things that happened at it. ‘Cause we’re on the cusp of it happening again here. And it’s just Democrats politicize — I’ll tell you what happened. I’m gonna tell you exactly what happened. The Democrats — this was 2002. George W. Bush had been president for two years, and they hated him. 9/11 had happened, and the politics of the aftermath of that were in full swing, and Bush was traveling the country already trying to gin up support for an attack on Iraq. And the entire episode of 9/11 was right in the middle of being politicized. And then Wellstone’s plane went down and the Democrats thought that if they did this right, they could improve or increase the number of seats they would win in the midterm elections in 2002. The rule of thumb is this. The party not in the White House makes great gains in the first off year congressional elections. The theory is that the glow of the new president’s worn off and people are a little upset and unhappy, new president not meeting expectations — this is any president, by the way. It’s rule of thumb that the party in power will lose some seats in the 2002 midterms in the House and some in the Senate. The Democrats did their Wellstone memorial, and they turned it into a hate fest. It was a full-fledged hate fest. And they ended up losing seats in the midterms. I did election night coverage on NBC that night with Tim Russert and Tom Brokaw. And Brokaw was just stunned. I got more camera time than they ever intended ’cause Brokaw couldn’t speak. RUSH: To the Wellstone memorial. And again, we’re revisiting this. This was October 29th, 2002. This is like a week before the 2002 midterms. And the reason we’re revisiting this is because it’s 18 years ago and this audience growth is amazing. There are people listening now that may not remember the Wellstone memorial, may not remember the way we dealt with it, may not remember its relevance. The relevance is that the Democrats will hijack anything — a funeral, a memorial, a disaster to advance their political agenda. And they’re doing it now. They’re doing it in the aftermath of the school shooting in Florida. They are hijacking this for the purposes of advancing their political agenda, which is highlighted by an attack on the NRA and getting rid of guns, Second Amendment. You know the drill. And if you look at pictures from the rally in Tallahassee and people gathered in Washington, you see things on people’s T-shirts and signs being carried that have nothing to do with what happened in Florida. And you see that family members of victims from the Orlando nightclub shooting have been brought in to join the protest movement. It has ballooned, and the Democrats hijack these events because they can’t help themselves. They believe this is the way to defeat Republicans, and this is the way to advance their agenda. Well, they did it with the death of Paul Wellstone. He died in a plane crash in 2002. There was a memorial for the public. The funeral’s private. There was a memorial for the public in a 15,000-seat arena in Minneapolis/St. Paul somewhere. And a bunch of Wellstone’s Republican colleagues in the Senate went ’cause it was a memorial. It was to pay respects and to remember Paul Wellstone. And they got booed and harassed to the point they had to leave for their own safety. And then the Democrats took to the microphones, and they turned this into an ugly, hate-filled political rally that they kept referring to as something dedicated to the memory of Paul Wellstone. They ended up losing the midterm elections in 2002. That has been done much. The party out of power generally does pretty well in the first off-year elections. They managed to lose. We’ll start with Tom Harkin, Democrat senator from Iowa. This was his big finish. HARKIN: (screaming crowd) For Paul Wellstone, will you stand up and keep fighting for social and economic justice? Say YES! HARKIN: For Paul! For Paul, will you stand up and keep fighting for better wages, for those who mop our floors and clean our bathrooms, for those who take care of our elderly, take care of our sick, teach our kids, and help our homeless? Say YES! HARKIN: For Paul, will you stand up and keep fighting for cleaner air and cleaner water, for a cleaner environment for our children and our future! Say YES! HARKIN: For Paul, will you stand up and keep fighting, for peace and understanding and to stop the exploitation of women and children around the world? Say YES! HARKIN: For Paul! For Paul, will you stand up, and keep fighting to end discrimination based on race, gender, religion, ethnicity or sexual orientation? Say YES! HARKIN: For Paul, will you stand up and keep fighting for the poor, the homeless, and those left on the roadside of life? Say YES! HARKIN: Now let’s all get on that bus together, that green bus, that bus of hope and let’s keep it moving to a better America! 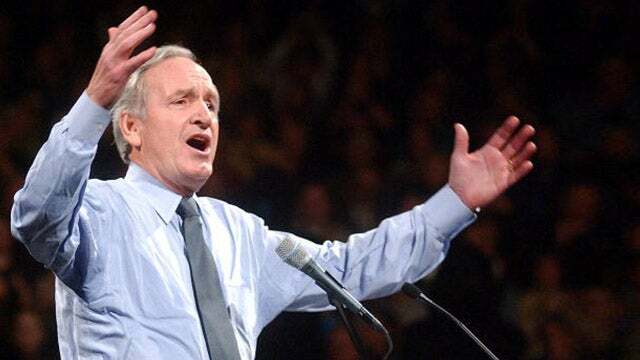 HARKIN: Keep standing up! Keep fighting! Keep saying YES to justice, to hope! For people, for Paul! HARKIN: (pounding the podium) For Paul! For Paul! For Paul! For Paul! For Paul! For Paul! RUSH: This thing went on for two hours like this. You see the picture of America that Harkin is painting here? It’s of endless misery, endless suffering, endless filth, endless injustice, endless dirt, endless discrimination. I mean, the picture that they paint, they think they’re gonna win with this. Sometimes they have. But they don’t win national elections like this, unless they’ve got Obama massaging these issues in his unique professorial way. Up next, Wellstone montage here. This is Wellstone’s son, Mark, talking about his father. RUSH: That is Mark Wellstone, son of Paul Wellstone at the Wellstone memorial. Now, I’m gonna predict to you, some of these things you heard Harkin say, you’re gonna see these signs eventually at these gun control rallies. You’re gonna see signs about homeless injustice. You’re gonna see signs about exploitation of women and minorities. You’re gonna see all of that, like you see in Ferguson, like you see in Baltimore. There’s two more, but you know to be fair about this, jam everything in, let me take a brief time-out, just two more. Some might say they are the piece de resistance. Don’t go away. RUSH: Okay, the next sound bite, Rick Kahn, former Wellstone student and treasurer of his campaign. RUSH: That’s not a technical problem there. Our tape didn’t stick. He just kept saying that that’s what they were gonna do. Again, he’s a former Wellstone student. Wellstone was a poli-sci professor and treasurer of his campaign. His name is Rick Kahn, and here we go with the last one. KAHN: Tonight we are filled to overflowing with overwhelming grief and sorrow. RUSH: Didn’t sound like that. KAHN: If Paul Wellstone’s legacy in the Senate comes to an end within just days after this unspeakable tragedy, then our spirits will be crushed and we will drown in a river of tears. We are begging you, do not let this happen. We are begging you to help us win this Senate election for Paul Wellstone. We can be the answer to his prayers, if you help us win this election for Paul Wellstone. RUSH: It was a memorial! Imagine yourself at a memorial for your family member and somebody hijacks it to advance something they care about, at the expense of your deceased family member. This was televised by C-SPAN. It was widely televised ’cause everybody in the media thought it was gonna be a grand home run for the Democrats, and it led to a shocking defeat some one week later.